Sometimes cooking a healthy meal from scratch just isn’t in the cards, especially after a long day. One of the greatest gifts any busy person can give themselves is grabbing a store bought rotisserie chicken on the way home from work or after picking the kids up from school. Once you have your roasted chicken at home, all you have to do is slice or shred it up and combine it with some healthy fats and some low carb vegetables for a perfectly ketogenic meal. Utilizing freshly baked rotisserie chicken can come in handy when you’re in a pinch and have virtually no time to spend making dinner. It’s moist, tender, flavorful, perfectly cooked, and only one stop away. Not only that, these chickens are also typically cheaper than buying a whole raw chicken, so you’ll be saving money as well. Instead of taking an hour messing around with seasonings, melting butter, turning on a hot oven, and roasting a full chicken for an hour, the store has conveniently done all of that for you. Grab a store bought rotisserie chicken from the supermarket and the sky’s the limit. Also since this protein is extremely versatile, you can whip up nearly any of your favorite chicken dishes in less than half the time it would normally take when the protein is all ready to go for you. One of the biggest reasons why eating a ketogenic diet is so simple is that you are really only worried about two macronutrients: protein and fat. Carbohydrates should be mainly be coming from low glycemic veggies, so once you have your protein source figured out, simply add some healthy fats to your plate. If you have even less time to spare and can’t make this particular recipe, slice up your rotisserie chicken, add some steamed broccoli to your plate, and pour on some healthy fat such as MCT oil, avocado oil, olive oil, coconut oil, or melted butter. Dinner can be on the table in less than 2 minutes. Using shortcuts during the week like buying store bought chicken can help you reach your fitness goals. Instead of worrying about elaborate meals with complicated recipes, you can focus on the basics and keep things simple. No more getting so overwhelmed with your keto meal choices that you give up before you really get going. Rotisserie chickens can be found at virtually any and all supermarkets these days. A great and healthy weeknight meal that’s packed with protein is only one stop away on your next drive home from work. Combine everything you love about home cooked meals with the convenience of store bought chicken whenever you are pressed for time. 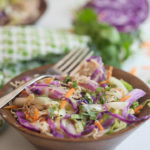 Skip the take out and have a delicious dinner on the table in less than 10 minutes with this quick and easy, flavorful keto egg roll in a bowl. Heat a large wok or pan under medium heat. Add coconut oil, onions, and garlic. Cook for 2-3 minutes. Add cabbage slaw, cooked chicken, salt, pepper, chili paste, and soy sauce. Cook for 5-6 minutes until veggies are softened. Re-adjust seasoning as desired. Top with sesame seeds and chopped green onion.